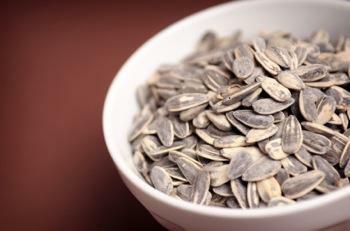 Sunflower seeds are an excellent plant source of L-arginine. L-arginine is an amino acid that your body can manufacture, meaning that you don't need to get it all from your diet like you do the eight essential amino acids. Babies can't make arginine and need to get it entirely from mother's milk; but small children should not be supplemented with L-arginine as there is no medical research that indicates how they will be affected in the long term. Since your body makes L-arginine, you don't really need to take a whole lot when supplementing your diet. In fact, the FDA has not established a daily recommended dose, though a standard dose in pill-form is two to three grams, several times a day, with a maximum of nine grams in a 24-hour period. A healthier way to supplement your diet with this amino acid is by eating foods that are high in arginine, such as nuts, legumes, sunflower seeds and dairy products. While there is really no recommended daily dosage of L-arginine, studies are being performed that indicate certain dosages can achieve desired effects, such as improved immune function and combating erectile dysfunction. If you decide you do want to supplement your diet with arginine, consider starting with a small dose and seeing if you achieve your desired results after three or four weeks. As always, if you're unsure about how much of a nutritional supplement to take, you should consult your doctor or other health care provider to make sure that you don't accidentally hurt yourself. While overdoses in L-arginine are rare, it is always possible to take too much of a substance. Are You Not Getting Enough? 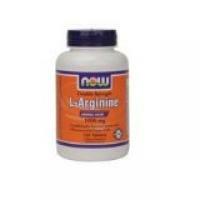 Talk with your doctor if you feel you have an L-arginine deficiency.